Comfortable, functional and lightweight Warrior shirt and combat trousers are perfect for Airsoft and paintball enthusiasts. The close fitting shirt was designed to be worn under body armour systems and assault vests and features a high collar and zip up front, a single pocket with Hook and Loop panel on each upper sleeve, adjustable cuffs and elbow reinforcements with removable hard plastic elbow pads. 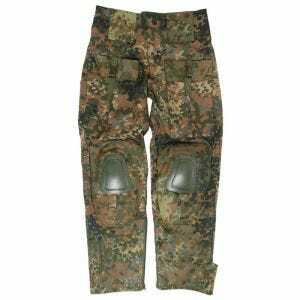 Combat trousers go with a zip fly with Hook and Loop and wide belt loops, six roomy pockets and rapid wear system, along with removable hard plastic knee pads and adjustable cuffs with Hook and Loop and calf zippers. 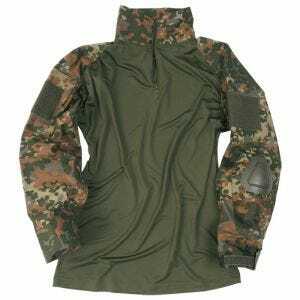 Durable and fast drying, Warrior uniform is available at Military 1st online store in a variety of colours and camouflage patterns, including classic Flecktarn camo, designed for use in temperate woodland terrains across Europe.